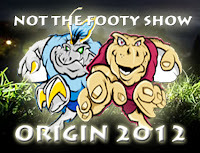 NSW Coach Ricky Stuart has made a forced and unforced change to the Blues heading into Game 2 of the 2012 State of Origin Series v Queensland to be played on Wednesday June 13 at ANZ Stadium in Sydney. The official NSW Team for Game 2 was named at 5pm Sunday June 3. Well no one is shocked to see the State of Origin career of Jamie Buhrer over after 7 minutes, but Ben Creagh's held his spot in the team and that's slightly more surprising given Creagh's lack of impact in Game 1. Creagh is joined on the bench by Game 1 starter Luke Lewis, who makes way for the move of Paul Gallen to lock and the inclusion of Penrith prop Tim Grant - who has been huge for the Panthers since returning from injury recently - but how Aaron Woods also didn't force his way in given he has been in even better form for the Tigers (and at the expense of Creagh) is the biggest question Ricky Stuart needs to address. Anthony Watmough has also been included after being omitted for 'injury' reasons in Game 1, with Tony Williams missing due to a back injury. There are no other changes, with Todd Carney needing a huge game to keep the series alive. The Official QLD team will be named around lunchtime (1pm) Tuesday June 5. NOT The Footy Show will dissect both teams on Episode 110 this Wednesday June 6 at 8:15pm and on the podcast which will be uploaded at 11pm. CAN THE COCKROACHES SNAG A WIN IN GAME 2 LIKE LAST YEAR? NOT The Footy Show is an NRL Show available via an iTunes Podcast and on our YouTube Channel. Subscribe to the Podcast here.